Did you know that Crete celebrates 12 months a year? Did you also know that many of these celebrations go as far back in to time when the Ancient Gods and Titans fought for the ruling of this world? Through these celebrations someone gets to know the historical, the mythical and social fabric of this island. It might be a few decades now in Crete that we no longer see the farmer bringing home on the first day of the year the cow home. Hold on a moment a cow? In Crete? A cow in these mountains? All i see here on my arrival are sheep and goats! Yes a Cow, for this blessed animal shall set foot as the first visitor on the first day of the first month of the year! A gentle kind large animal and mother a symbol of strength a blessing visiting the house hold bringing good luck. St.Basil is the saint celebrated on new years eve in Greek Orthodoxy, the patron Saint of those working the fields with animals and protector of the crops. A harmless gentle visitor should be the first visitor so the rest of the year would run smoothly, a visitor that you trusted, a reliable visitor, a companion to your struggles, a hard working companion…so the cow was treated with sweet bread, homemade sweets and brought home. Her horns would be decorated with bread jewels, sweets that resemble the plow are given since the plow symbolizes hard and honest labor. The cow would leave the family well fed, well treated and entertained willing to work hard and well for the family. New year though is also a celebration loved by children as new beginnings in life then are welcomed and time is sweet when one is young! So the children visit the houses of their village and neighborhood to receive sweets and blessings from the older neighbors. In other villages the icon of the patron Saint was brought home by the women of each family as a blessing. On the first day of the year a plate with sweets and wine was sent to the church of every village for the living to enjoy but also to remember the ones absent. A New Year is a New Beginning, some things though are archetypal… A mother, a wife would give oranges to her loved family members, the fragrance is so strong the fruit so sweet and the color so bright even in winter! Children are often given pomegranates, vibrant red, the multiple seeds symbolizing prosperity and unity of people. A fruit with strong Mythological interpretations, it was the gift given to Persephone by Hades when she was in the underworld…in the realm of Death, but she finds her way back up to the surface of the earth having eaten this fruit, victorious and alive! As Persephone has not yet returned from the underworld in January the earth is frozen…the flowers absent but hope is needed the promise of life light and sun, so women traditionally would find a plant that connected this frozen dormant earth with the underworld and bring it home. This plant with its long wide leafs is a bulb it blossoms even out of the soil. It is known in Crete as The Immortal. Another tradition is the Mantinades the rhymes and songs small poems that are exchanged instead of wishes. Someone who can yield a good Mantinada is well respected. The blessing of the waters, the baptism of Christ. It is a much older tradition embedded in Christianity, the moment that the God makes an appearance, the Epiphany that we see so very often in the Minoan rings of Crete 1700 B.C. The waters are blessed, but through and by water we arrive and we are christened. After a long service the city, the town the village is blessed and finally the sea. The sea after being blessed becomes calm and from this day onward the sailors can travel safely. The cross is hoisted into the sea by the priest and brave swimmers dive into the freezing sea to retrieve it. The blessing of the waters represents for the Cretans the catharsis of the world, the cosmos is protected and order is reestablished. All water in homes, water given to livestock has to be renewed after the blessing of the waters on the 06 of January. For those away from the sea or rivers, the priest blesses the live stock after blessing the homes of people. Shepherds ask the priest to bless the animals on this day in Crete. On this day farmers fast through all out the country site and give their animals of labor, herds and flocks gifts of fruit nuts and grains, no animal must feel deprived on this day . Saint John the Baptist is celebrated on this day, for after Christ is baptized he has become St.John the Baptist. The children that have been recently baptized receive their first communion, the godfather or godmother visits the god child and family. These three saints in the understanding of the Cretan soul are the saints of winter. St.Antony is the saint of the snow capped mountains harsh weather conditions, a saint found in caves in ravines. A hermit, so that’s why we find chapels dedicated to this saint in such remote places. He is the patron saint of those who fight their inner demons as well as all those fighting arthritis. Large fires are set when celebrating St.Antony not only for warmth but for light as it is so very dark mid January for us Cretans who love the sun and the light so much. In Western Crete the area of Sfakia people make bread loafs in human form dedicated to St.Antony. They are taken to church and blessed as St.Antony is seen as a healer, just like the ancient god Asklipios, for in ancient Greece if the soul suffers the body suffers too. 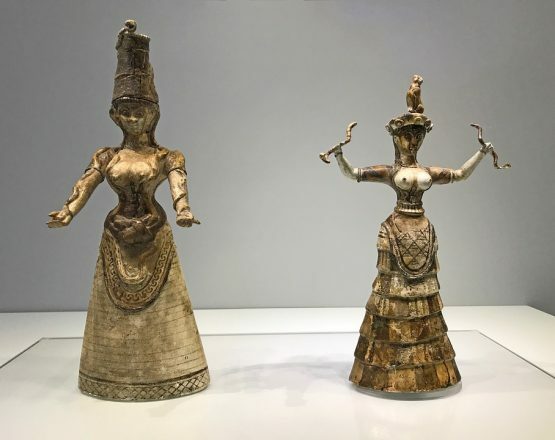 Body limbs out of bread votive offerings instead of the ancient Neolithic clay offerings on display in the Archaeological-museum of Heraklion. A celebration dedicated to scholars, schools and all students in all paths of life. Saint Tryfonas is portrayed as a young man: an embodiment of the promise of spring, so eagerly awaited by all those that work the land and vines. (He is also a Saint that can heal the ill.) He is often painted with geese, as he was goose herder. 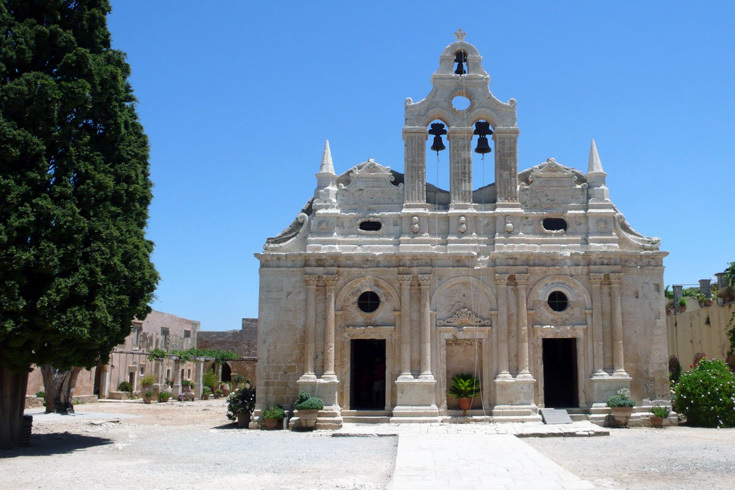 Monasteries and churches dedicated to him are found in southern Crete – and also near the archaeological site of Knossos. He ensures the growth of the crops, but most importantly the gathering of a good harvest of wine and table grapes, as well as sultanina raisins. He will protect the crops from insects and locusts, so locals take to the church today baskets full of vegetables, which are arranged beside his icon. After the service, food from the offerings is distributed to all – even those who just happen to be passing by. A unique celebration dedicated to the mother of Christ here in Crete, the celebration initially was conducted in a cave in Western Crete close by the Monastery Gouverneto in Chania. Now they occur in other areas of the island as well. What we recognize in this event is the continuation of a tradition that is very ancient: this cave was once dedicated to the ancient goddess Artemis (Diana), whom you might associate with wild animals, the moon and hunting. But this virgin goddess also had a role as the goddess of childbirth. The cave has stalactites and stalagmites that ‘form’ a huge bear: one of the sacred animals of this ancient goddess. The ancient celebrations are part of the Candlemas of the Greek Christian Orthodoxy today: Christ was taken to the temple this day. Bears are renown for being good mothers (kourotrophes). They can ‘overlap’ with the great mother holding her divine child in antiquity; and do so still later – first as the virgin Mary in Biblical times and finally the more modern Virgin Mary of the Bear, who is the protector of pregnant women, mothers and young children. In many caves all around Crete, the Bear-version of the Virgin Mary is celebrated with bonfires, at night services held in the light of torches. In Greek mythology, the Bears, Arctos both little and large, became stars (Ursa Minor and Major), in reward for their protection of Zeus in his infancy. Bears often protect children in these stories. Celebrated at the beginning of February, this bearded saint is associated with the scars that children might bear if their mother dared to sew, while pregnant. So pregnant women in Crete would never risk any sewing or knitting on this saint’s name day. A saint actually of Alexandria in Egypt, he appears at the very eastern tip of Crete (Cavo Sidero, where a monastery is dedicated to him. As a hermit, he spent time in the desert: which habit explains why we have monasteries dedicated to this saint in far off and remote areas. Like in many cases when celebrating Saint Isidore, his pilgrims come on foot, bringing those wild greens that they have collected along the way. Large fires are set going, so that the food is cooked through the night, before the early morning service. Saint Vlasios, the Hermit, spent most of his life in caves, dwelling among wild animals that he had tamed. This saint also helped pregnant women, so in Crete sweets are made by pregnant women and given to friends in his name. Saint Polikarpos was the bishop of Ishmir – in Asia Minor. Polikarpos, meaning many fruits, is naturally the saint responsible for the well-being of the fruits and fruiting plants. The celebrations of this saint are intertwined with celebrations to ensure prosperity in antiquity. The date will vary, being linked to that of Easter .. some years as early as February, others a good month later. The Greek Carnival is celebrated before Easter, but its roots go far back, to when the ancient people of Greece celebrated the life, death and resurrection of the ancient God Dionysus. This celebration was an opportunity for the rural population from antiquity onwards to enjoy themselves, as well as strengthening the ties among the people. The modern Carnival coincides with the ancient festival of Anthestiria (one of Flowers): these celebrations were to mark the moment the Gates of Hades opened – and souls were set free for a while. So even today, makaria (in memory of, in Greek) makaroni is served. No trees (a flower of sorts) are cut during these days. All in memory of the souls that have passed. One of cities in Greece where Carnival is enjoyed the most is the city of Rethymno: every year 15,000 people attend and 25 floats parade in the streets! But in villages too, such as Meronas to the south of Rethymno, the celebrations are renown through all the island. Games, theater, teasing, the wedding, the funeral, the confession and the camel take place in the village square. Carnival is first celebrated within the family unit and close friends, and then spills out onto the streets, with different costumes (designed and made, or bought) and themes each year. On this day food is given to the poor, in the name of the souls who have passed away. People dress up on this day as well. In villages, animal hides are worn, large bells raise a clamour and lots of teasing takes place. It is the moment when farmers and shepherds evoke the past, and ask of nature and the past to permit the present to flourish, and so provide a future. It is an explosion of life, unleashing new life. Normality departs. People wear their clothes inside out, sprout animal horns or don masks etc. Wearing a large phallus represents virility; men dress as women, theatrically-dressed ‘brides’ – all male – provoke and tease other males; shocking and naughty jokes are shared and savoured. In antiquity, Dionysus had transformed himself to escape death, but was nonetheless killed and eaten: before rising from the dead. Echoes of these ancient traditions can be clearly detected during the Cretan carnival .. as people evoke all souls and harness the power of nature, to first unleash its wild powers and then to restore normality and ensure prosperity. Night parades accompanied by musicians announce the opening of the celebrations and the carnival. After the night parade in the city of Rethymno, the mayor hands the keys of the city over: symbolizing his relinquishing of control to the unruly forces about to erupt. While all the celebrations described above take place, the older women make preparations to honour the departed souls. Finally on Carnival Sunday, the main parade takes place. It is deemed that spring must have decided to return, and that the souls are pleased. As Sunday passes into Monday (Clean Monday – Katheri Deftera), Lent begins. Normality reasserts itself: the kes of the city of Rethymno return to the mayor; the effigy of the Carnival King is burned on the beach of Rethymno, among fireworks. After Clean Monday, we leave behind the recent abundance of food and alcohol. We begin the slow and accumulating fast, until Easter. Special food is consumed on this Monday, preparing us for Lent. People eat taramas (fish eggs/roes dip), squid, shrimp, octopus – denizens of the deep, for no red meat, no blood, must be drawn this day. The flying of kites in the open fields is enthusiastically pursued on this Monday: the fragile constructions of paper and string ascending ever aloft, to become mere dots in the skies – wafting away on the clean winds of heaven and cleansing the sins of the world below. The first month of Spring. The month of the return of the swallows, victory of light over darkness. Before the first of January in 46 B.C. New Year was celebrated the 1 of March, traces of this is still prominent through all out Greece today not just in Crete. March the month of promise of summer but still holds some cold and frosty days we all must be cautious for winter has not had its final word yet! Crowns out of flowers are made and decorate beds, little girls icons. The ill on the first day of March in Crete are beaten gently with vine branches the sacred vine of Dionysus and Jesus Christ, after the gentle beating the patient takes the vine home and sets fire to it on Easter Sunday in this way the victory of life over death is guaranteed. Many poems and rhymes are sang on this day to cure people and livestock that suffered through winter and have not recovered. March arrived today, change your hide, grow and become beautiful, change your garments and to the sky you shall reach! The tradition of making a bracelet out of red and white thread is not only found here in Crete but also in other Balkan countries. Very probably a tradition that is very old for St.John did not approve of it! Traditionally these bracelets are woven by women for their children to protect them having left the threads out all night under the starry night and bathed the threads in the light of the moon before making the precious bracelets. During the first days of March traditionally in Crete the women also make bread and sweets in shape of swallow nests, a treat for the family and guests. etc. 40 is a number of new beginnings, the 40 saints are young with no beard, handsome and young they will encourage new beginnings and help those who work the land and grapevine. On the 9 of March while the men tend to the vines women collect 40 herbs to prepare the 40 herbal tea much loved in Crete that is very powerful and potent. Sarandavotano is the name of this tea or Sarandadentri one must try this tea! The Annunciation of the Virgin Mary is celebrated. Spring is here, a special bank holiday with many feasts all through the island. Flowers, many flowers dedicated to the mother of Christ lilies are offered and left in churches for a miracle is conceived, for life is celebrated. On this day people consume fish and alcohol usually cod if no fresh fish was available. In local tavernas or village squares whole families and friends meet to celebrate life, the pure miracle of life. The most important birthdays in Greek Orthodoxy are those of Jesus Christ on December 25 and of Saint John on 24 June. Saint John is said to have been 6 months older than Jesus Christ: a significant halving of the year. On the 24 of June bonfires are set: they symbolize the midsummer sun and its light. After sunset the fires are lit and blaze up. People jump over them. Such practices can remind us of the myth of Demeter trying to immortalize the infant Dimofonta by passing him over fire; or Thetis with her son Achilles. This fire-jumping tradition is associated in Crete with Saint John Klidonas. The leaping takes place to music and dancing. Wine and food is enjoyed. Saint John is also the patron saint of the beekeepers. July is traditionally the month that the Greeks and Cretans of the countryside work hard, out in the fields. Now is the time of the year when people must start the harvesting and even think ahead about storing up for next winter. Although people drive themselves, there is yet time for feasting and merriment. July begins with the celebrations dedicated to the Virgin Mary. On this day women in the village of Dafnes near Heraklion in Crete tie a string around the church. This tradition may also carried out by the women at any time of the year after a catastrophe: in this case though the string must go round the whole village, to protect it and the people within it. In the village of Axos in Crete you can see string tied round the old church, accompanied by candles, also for protection. Churches dedicated to this saint exist in Pontos Konitsa , Nikomedia and Kappadokia. On this day no work is done: she is the patron Saint of the Grapes and Vines for the Cretans. To celebrate this saint, people today are still willing to march for days and nights to arrive at the church dedicated to her. Many even walk without shoes! Upon arrival a great feast gets under way: many merchants of the area sell their goods to the tired pilgrims. There are 16 churches in Crete dedicated to this Saint, with wall paintings. In these paintings we see the young Saint Marina destroying evil, by smashing its head with a hammer. Saint Marina also has healing powers: springs near churches dedicated to her are blessed. This powerful Prophet is usually worshiped on the tops of mountain peaks, throughout all Greece. These very same spots not infrequently were previously used by the Minoans, who also were drawn to the heights, as well as to the depths of the caves. harvest is fruitful. One may place a heavy stone in an opening in the trunk of each and every olive tree: in the hope that the tree will strong like a rock! The Transfiguration of Christ .. in Greek he is Afendis Christos (Christ the Lord). In Crete, four feast-days are celebrated on mountain peaks: Transfiguration of Christ, Holy Trinity , Holy Cross and Prophet Elias. The mountains .. the High Grounds .. have for many different peoples and creeds represented the way to approach a Higher Being – in what more natural environment would one expect to encounter such a Being? The view of the valleys below all the way to the sea is breathtaking from here… Traditionally during the celebrations the Cretans offer up the first-fruits from the grape harvest, women sweet bread. In this special celebration of Greek Orthodoxy, the pilgrims in Crete begin fasting (from 31 July); some will walk for days to reach the Monastery and to sleep under the starry skies, performing their Tama (vows). Huts are made out of bamboo and tree branches and the pilgrims settle down together around those Holy Monasteries dedicated to the Virgin Mary. Food is prepared by all concerned and shared, after days of fasting, on the 15 August – which marks the climax of the festival. After the celebrations have come to an end, caravans of people depart. In August, the Cretans offer to the Churches of their parish the sacred herb basil. The plants destined were chosen back in May and by August should be thriving and a good gift to take to the church. The women of the community in August will predict the weather of the coming winter and the following year. 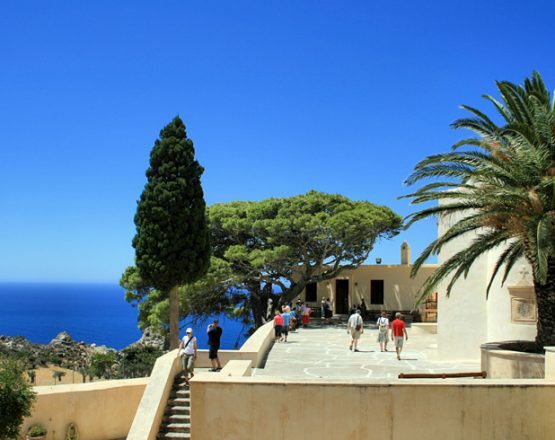 The Holy Monastery of Saint Eftychis goes back to the Venetian Period in Crete. In Greek Ef = Good, and Tychi = Luck . A Saint of Good Luck that in the Greek Language is the definition of happiness! Saint Titus: the First Bishop of Crete and disciple of Saint Paul. The Patron Saint of Heraklion, Crete. In the cathedral in Heraklion, dedicated to Saint Titus, on this day a tremendous feast takes place. The 25 August also has a dark side: it marks the anniversary of the massacre that took place in 1898 in Heraklion under the Ottoman rule. When one needs guidance to see one’s way forward, to find something, to recover something missing – this is the Saint you pray to. Saint Fanourios can help you find solutions, things lost (from a flock of sheep to a pet lamb), and even someone to share your life with. We have plenty of churches dedicated to this useful Saint: and he is often depicted in frescoes in all sorts of churches on the island. A sweet cake is given to the Saint – and all will be revealed! On 27 August, the Cretans either express gratitude for help rendered – or ask especially for aid. On the mountain plain of Nida, Saint Fanourios plays a serious role in the summertime community of the shepherds in resolving disputes …no one dares to lie in front of his icon in his little church: all that has gone astray must be recovered – and the act forgiven. Saint John Rigologos (the Shiverer) .. better known perhaps as John the Baptist. On this day in Crete, neither fish is consumed (even though it is often served in fasts), nor olive oil, nor tomatoes. According to tradition, after Saint John was beheaded, his body shook and shivered. Thus anyone who shakes can be cured if they fast on this day and pray to Saint John Rigologo: e.g. those who suffered from malaria. The Holy Belt of the Virgin Mary. Traditionally, the Holy Belt will cure people from plagues .. both illnesses, and those brought about by such as swarms of locusts. The belt also protects women during pregnancy and labour. A belt, which is something worn by both sexes, forms a circle around the body – protecting the body metaphorically. The same thinking will permit an unbroken string to encircle and protect – say a church .. right the way up to a village. On September first in Crete we have again overlapping celebration dedicated to the New year of agriculture of the Virgin Mary. On this day the fruit are blessed,the wheat and barley people attending services bring a plate of wheat to share and offer. After service is held the seeds are blessed and the farmers can begin to seed their crops and seed last the pomegranate,it is the time of the year of the return of Persephone to the underworld and Hades,winter is close. In September the pomegranate is bright Red, it is often set beside the icon of the Virgin Mary. Pomegranates are placed in certain rooms of the house to protect the family to ensure a good and prosperous harvest. In the ravine Kourtaliotiko of Saint Nikolaos the icon is decorated with flowers in his memory and celebrated by shepherds. Saint Mamas the Saint of the shepherds depicted holding a baby lamb in Crete. Understandably he is worshiped in areas in Crete with many flocks of sheep and their shepherds. According to tradition this Saint did not live in towns but instead up in the mountains with shepherds in the first centuries AD. If a shepherd has ill sheep Saint Mamas will heal the flock . Up in the village of Anogia the family Skoula a large family set a feast all night animals are sacrificed and served to the devoted pilgrims attending. In other areas of Crete the shepherds take their sheep to be blessed by the priest of the church dedicated to Saint Mamas, after the service the priest throws a bell to the flocks that have received their blessing the animal that is hit by the bell is a chosen lucky one and of corse the bell is placed round its neck. A Saint who protects like Saint Nikolas those who sale the sea, his chapels are often beside the sea and pilgrims arrive with food and wine and camp out at night during his celebrations. Nunnery of Kera Kardiotissa Lassithi. In this Nunnery in particular we have the miraculous icon of the Virgin Mary, frescos of the Byzantine period and the iron Chain of the Virgin Mary that is miraculous.The Chain one wrapped around a woman heals,helps and enables women to conceive a child. The harvest has began the first wheat picked is taken to church by the farmers. A cross out of Wheat is woven and hung in churches and homes. Basil is also offered and used in the Greek Orthodox tradition Basil is also associated with the Holy Cross as it helped Saint Helen and Constantine discover the true cross,in Greek Basil is referred to as the flower of Christ. So on the highest peak of Crete dedicated to the Holy Cross pilgrims clime and place a cross out of Wheat. But in many mountain peaks of Crete in Chania and Rethymno this takes place on this day of the year. The tiny stone chapels perched on mountain peaks after a long hike become not only a place of pilgrim but also where the night is spent.A bony rocky wind honed stone bedding under the brightest sky one can find in Crete.Food wine warmth all is shared. The feast of Kofinas still carries the older ways of worshiping trees, the tree cult the sacred tree Militsa. One realises it’s not an easy hike up these mountains of Crete harder for older people and little children when performing their Tama, collecting sacred leaves from the sacred Militsa Tree that grows in these parts of the island only ,ales things harder. On this day in the Holy Monastery of Preveli the sacred Cross said to have a splinter of the true cross is celebrated.This cross helps people with eye site problems many visit to be healed. This Saint protects the Cretans from the Pirate raids that for centuries either looted the island or occupied it. In the south of Chania the people of Sfakia celebrate with Bonfires,horse racing,dancing ,lots of food, milk and wine! Saint Efstathios protector of Hunters and those who live in the country site. Local Saint John of Crete that reside mainly in Western Crete . There are two Hermits in Crete named John often these 2 overlap. The celebration of the Virgin Mary of the Myrtle was introduced to Crete by the small island of Kythira. Again here we find the tree cult . In the Monastery Nunnery Paliani a very old Myrtle stands in the courtyard ribbons and gifts tied to its branches,on the 24 of September the celebrations bring many to the Nunnery votive offerings are brought, gifts food is served and hopefully all those who suffer from mobility problems improve and even recover. It is interesting witnessing the blessing of the sweet bread under the tree and the altar is an ancient capital of a column ….the tree cult is obvious here again. Celebrations dedicated to Saint John the Theologian. Monasteries dedicated to this Saint provide shelter and food to the pilgrims that after offering the sweet bread and attending the service spent the night there. This particular John, according to tradition, arrived in Crete from Cyprus, with another 98 monks. Many churches in Western Crete are dedicated to him, as well as caves. On the same day, Sergios and Vakhos are also celebrated: these two military saints are from the second Byzantine period, when Crete was liberated from the Saracen pirates by Nikephoros Phocas and Crete was reunited with the Greek Byzantine Empire. The saint that rides the red horse – another military saint. The 26 of October announces the beginning of winter; St. George in spring, with his white mount, brings in the spring in a similar manner. Saints on mounts (in other words, warriors) are seen as extending a form of hope, since Crete has been so many times conquered and pillaged. St. Dimitrios is the patron saint of Thessaloniki in Northern Greece. In the province of Rethymno, the village of St. Dimitrios has in the church wall paintings of the 14 century. The name Dimitrios might remind you of the ancient Greek Goddess Dimitra (from Gi Mitera or Mother Earth): she was responsible for the well being of the crops. As October comes to an end the preparations begin for the olive harvest and we need all the Gods and saints we can have on our side! Crete is not famous for its soft pastures, rich soil and rain … the end of October is when the people of the island should also have finished ploughing the fields…but what if, following the summer’s heats, it had not rained all through autumn until October? Some rain is essential for both tilling the soil, and plumping up the olives so they are easy to pick. St. Dimitrios was their last hope! So cakes and bread are brought to any church dedicated to this saint: very much like what was done in Ancient Greece – to please the Goddess Dimitra. Thus you can easily see that in Crete (like in Greece generally) there exists a continuation of tradition centuries-long, with overlapping beliefs. In Heraklion on this day and in the wine country of the Pediadha just inland, the barrels are repaired or built. Naturally, some wine is offered to the saint: since St. Dimitrios just happens to be the patron saint of the guild of the coopers (barrel makers) and carpenters. In Chania St. Dimitrios, in the areas of Apokoronas and Kydonia, protects and brings peace to all those that are in conflict. People will reach common ground and resolve their differences over an icon of St. Dimitrios. He is very busy! On this day the mothers in the past took thought on how to safeguard their daughters from diseases that could scar them. Saint Barbara was called upon to protect them. She is often depicted with a helmet, a shield and spear – just like the Goddess Athena in her warlike role. Exactly what is needed to protect little children and girls from the smallpox. In Rethymno, the main church is dedicated to Saint Barbara, as she is the patron saint of the city: special sweet dishes are offered there in her honour. There are not many churches dedicated to Saint Savvas, the patron saint of those held captive and imprisoned – which is surprising, given how many insurrections the Cretans have attempted in the centuries of being occupied. In the mountain chain of Asterousia in south Crete, there exists the ravine of Saint Sava. The Saint is the main saint of the sailors, but in Crete we can yet find churches dedicated to him in ravines and on mountain peaks! As well as caring for those at sea, he also looks after shepherds in Crete (which explains the mountain-chapels). With the arrival of the Greek Refugees to Crete from Asia Minor in the 20th century, yet one more tradition involving Koliva (sweetened wheat and grains served at funerals) was introduced: it involved throwing the mix into the sea, so it will be no longer rough and dangerous. Saint Nikolas will be found, standing reassuringly beside any captain attempting to navigate a safe journey in troubled waters. Saint Modestos is depicted amongst animals on frescoes and icons: as he cares for animals and cures them. Sweet bread and young animals are offered and given as presents after church service. This Saint is a healer. Water taken from the caves where she is traditionally worshiped is used as Holy Water to cure the ill. Yet another occasion where important saints have to share …. On this day too in 249 AD, the 10 Saints (Agioi Deka) were put to death near Gortyna, then the Roman capital of Crete and Cyrenaica. For the Greek Orthodox, Christ is born in a cave (like many ancient Greek Gods), and indeed like many of the sheep of Crete. Special Christmas breads are prepared: bread and wine is mentioned often in the Homeric texts, so we can even possibly look back into Bronze Age Era to find already then that the concept of making, baking and offering special breads to celebrate life was practised. The breads of Crete today are very decorative: with seeds, walnuts, symbols and faces. Traditionally pork is served for Christmas: preparation of the pigs takes a couple of days still in some villages of Crete. The pig is sacrificed /slaughtered: it was one of the animals traditionally offered to the Greek Goddess Demeter. The men are in charge of the animals and the butchering, while the women mix the blood of the animal with seeds, to sow the fields, like Persephone! The sacred tree for the Cretans is the Olive tree. Tradition has it that it was very cold when Jesus was born and the Virgin Mary walked out of the cave to find wood … all she found was olive trees. But that was enough … this wood kept the infant Jesus warm. Because of this deed, it is why – whenever an olive tree is cut back to its roots – yet new shoots emerge, the everlasting promise of Christ: the victory of life over death!